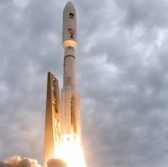 United Launch Alliance has taken over the marketing and sales of the Atlas V rocket from Lockheed Martin‘s commercial launch services business unit. ULA, a joint venture of Lockheed and Boeing, said Monday it is now fully authorized to market Atlas V launch services in the commercial sector. The company appointed Tom Tshudy, a ULA vice president and general counsel, as head of the new global commercial sales segment. Tshudy previously served as senior vice president and general counsel for International Launch Services as well as a vice president and general counsel at Lockheed when ILS was the defense contractor’s subsidiary. Atlas V has flown 75 missions with a success rate of 100 percent.